Disclaimer: This experiment was not a success when using a plastic bucket. The principle is sound, but the impervious nature of plastic prevents enough evaporation to cool the system noticeably. If I can find a 5 gallon unglazed terracotta bucket, I will try the experiment again. The evaporative cooling process is the same our bodies use to cool off when we sweat. 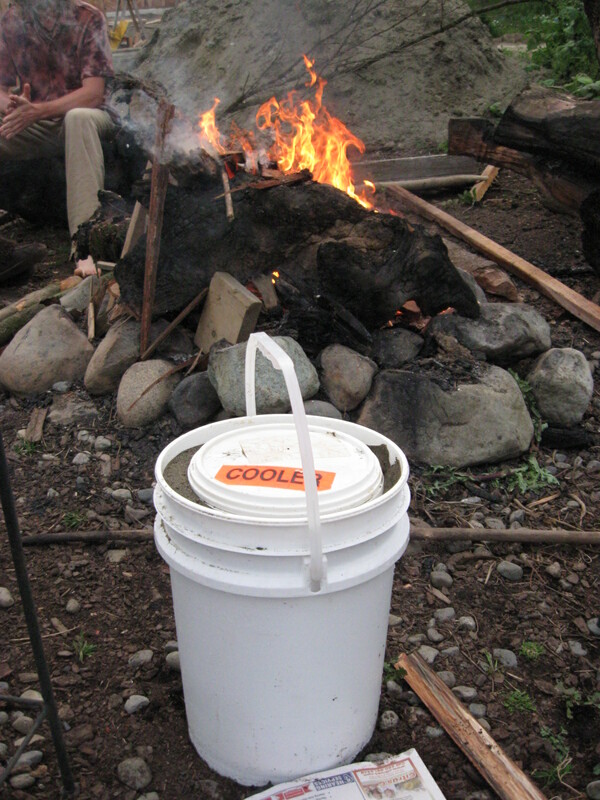 I built one of these pot refrigerators using one of my trusty five gallon buckets, but since the only contact with air is at the top, it did not evaporate enough to make any temperature difference. We tried to speed up the evaporation by putting our fridge beside a fire, so it would benefit from the heat and dry air, but it changed very little. We live in a very wet climate, which is bad for evaporation. The drier your locale, the better this type of fridge will work. Perhaps you could take a few steps from the swamp cooler option, and cut a few holes, then cover them with a porous material before adding the sand? Ancient and effective mechanism for evaporative cooling. Unfortunately, plastic does not allow for transpiration and evaporation. The key to effective cooling is utilizing fired clay (or homemade adobe) pots. 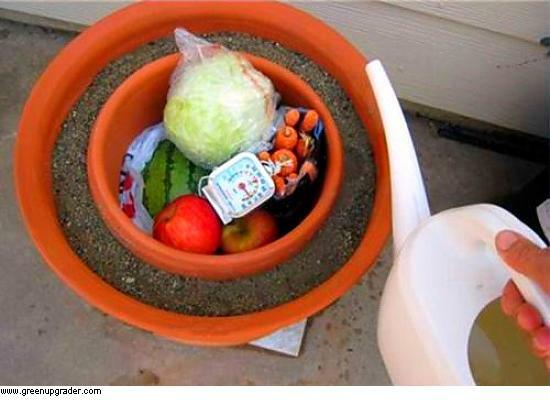 This only works with clay pots. It needs to be able to evaporate. And it doesnt work in humid environments. Only in hot dry ones. It has to be terra cotta, which has the highest porosity of all clays once fired. 3 2n1/2″ holes 180 degrees apart near the top of bucket .Get blue rope bucket& weed cover material from dollar treetops fit 5 gal bucket perfectly and also a ceramic diner plate from DT. Cut cardboard cut cardboard to cover materal to cover taped materialon inside of bucket. 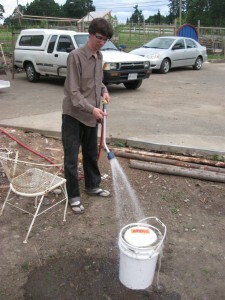 Fill bucket with to. And water to hole bottoms and walla.